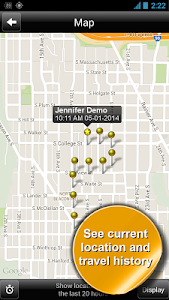 ✓ Locate another person and view his/her movements during the previous 72 hours. ✓ Permission based system allows/denies other users to follow you. ✓ GPS options to reduce battery usage. ✓ Follow both iPhones and Android phones. ✓ Follow your child's movements during the day. ✓ Know where a family member is at any time. 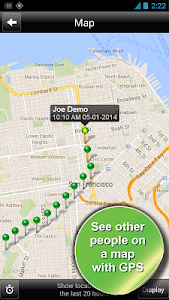 ✓ Track an employee's travel route. 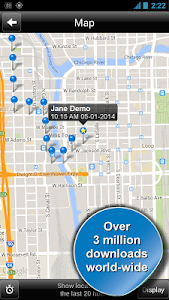 ✓ Find lost or stolen phones. ► Does the Phone Tracker record my location while running in the background? Yes, the app will continue to log your location until you reboot your phone or you turn the app off. ► Can I follow someone without their permission? No. You can only follow people with their permission. It is illegal to follow someone without their permission. ► How accurate is the phone tracking? 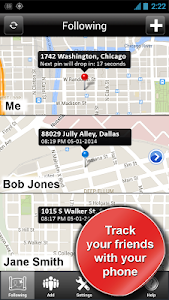 The Phone Tracker app DEMANDS accuracy to drop a pin. It will only drop a pin if it can determine our location within 30 feet (10 meters). 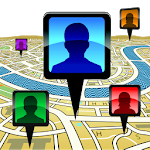 This Phone Tracker app is a professional GPS tracking solution that allows people to grant permission to see each other's location. It is not a game and you should ONLY allow people you trust to know your location. ★ IF YOU HAVE ANY PROBLEMS OR QUESTIONS ABOUT THE PHONE TRACKER, PLEASE EMAIL US AT: "[email protected]"
Similar to "Phone Tracker - GPS Tracking"